We made two significant changes since last year. First, after talking to many winning competitors and spending good money on classes from top teams, I am swallowing my pride and using commercial products instead of my own rubs and sauces. I still stand by my spare ribs using my NMT Basic BBQ Rub and NMT Cherry Barbecue Sauce as an excellent rib to eat at home. Competitions are just a different beast. they make moist, flavorful BBQ. 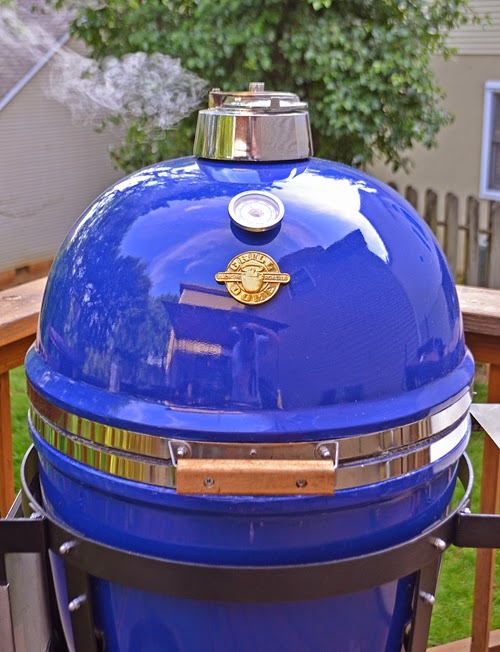 We will be cooking on the Grill Dome brand of kamado grills. 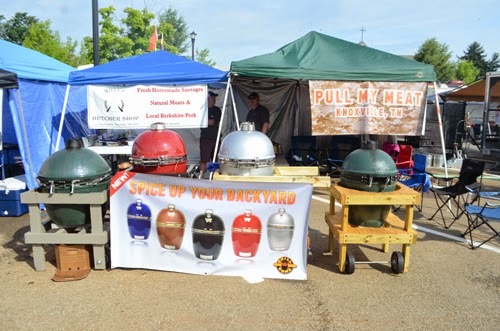 My first hands on experience with the Grill Dome brand was at the Blount BBQ Bash where a team called Pull My Meat was cooking on them. I was intrigued by the hinge design that has adjustment screws and spoke to one of the cooks about them compared to their Big Green Eggs. I walked away from that conversation very interested in them. These are stock Grill Domes - the exact same grill/smoker/roaster that you could have in your backyard. I love being out on my deck early in the morning with the smoker running while everyone else is just starting to wake up. It's so quiet and peaceful, like a walk alone on the beach. It really is like meditation. 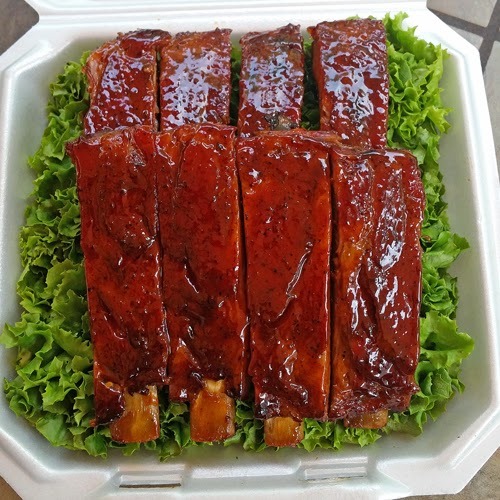 Here is how I am doing my competition ribs this year, assuming a standard KCBS turn in time of 12:30 Saturday. Before getting to the contest site, I have already trimmed 4 racks of pork spare ribs into St Louis style ribs. 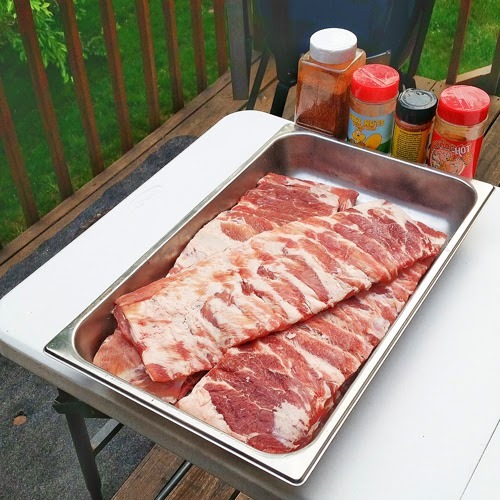 Here is a post I did on how to trim St Louis style ribs. They are just trimmed, there can't be any seasoning, brine, injections, or anything like that done to them until after the official meat inspection on Friday. If the weather forecast is for dry, I will get my coal and wood all set up Friday afternoon. If it is going to be super damp overnight (humid, raining), I will keep the coal somewhere nice and dry like my car then just load it in Saturday morning. I start with a cleaned out kamado grill - no ash or left over coal - so I can get started and up to cooking temperatures quickly. I bury several pieces of hickory chunks throughout the coal in the fire box and then top it with a little more coal. This is different than my pork and brisket set ups where I use a triangle burn set up. Light grill, set it up for indirect heat using a spider and drip pan and bring it up to 275°F. I want my grill to be steady and burning cleanly for at least an hour before my ribs go on. 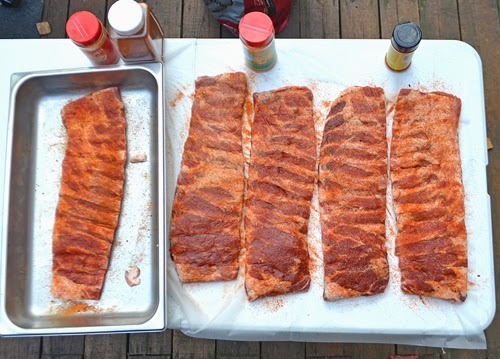 Season the ribs on both sides with a moderate coat of a sweet BBQ rub and a similar amount of a spicy BBQ rub. I'm going with Meat Church Deez Nuts for sweet and Smoking Guns Hot for the spicy. If you are trying this at home and want something you can buy from the grocery store, you could try a sweet rub like McCormick's Brown Sugar and Bourbon rub and use their Fiery Five Pepper rub as the spicy. You can buy pre-trimmed ribs at some places. GFS Marketplaces sells boxes of 5 from Chicago Meat Authority and Costco sells three packs of St Louis trimmed spares from Smithfield. All rubbed up and ready to go! 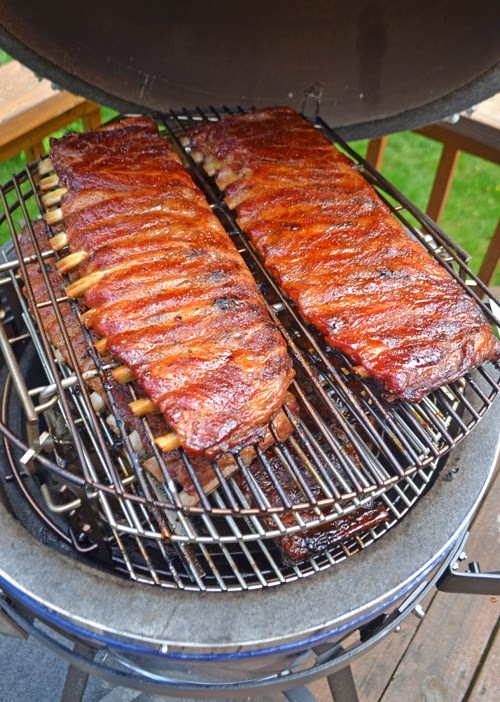 Place the ribs on the smoker with the bone side down and meat side up. I use a multi rack set up like the Grill Extender, a homemade second rack, or in this case I was using an Adjustable Rig. 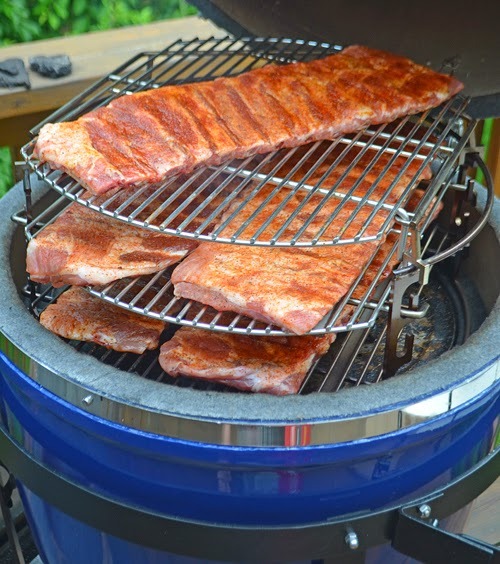 Whatever I use, I try to keep the ribs as far up in the cooking chamber that I can. Low in the chamber the rib ends will be over the hot spots and get too dark. 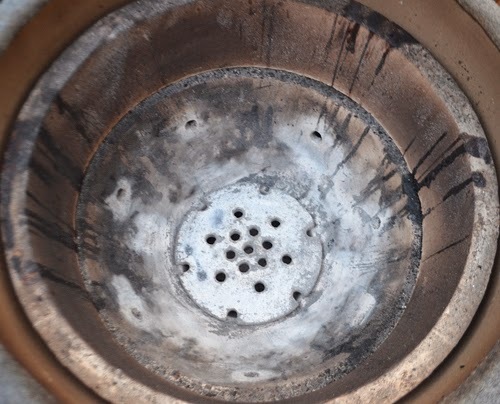 This is an example of when you know your kamado is ready for smoking. The thick, white smoke on the left is from incomplete combustion and will leave your food tasting like a foul smoke. 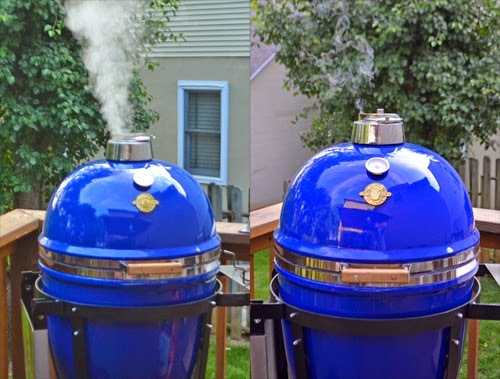 The one on the right is burning cleanly - the wood is still creating the compounds needed to make your food taste great and impart a smoke ring. 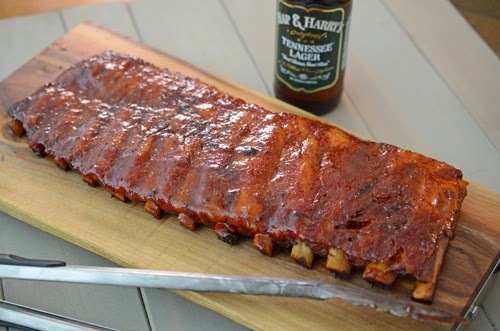 Spritz ribs with spray butter. 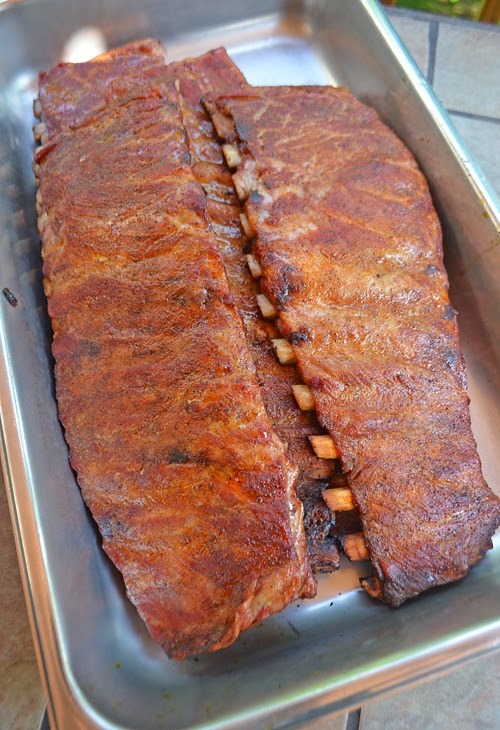 Pull ribs from smoker and foil them. 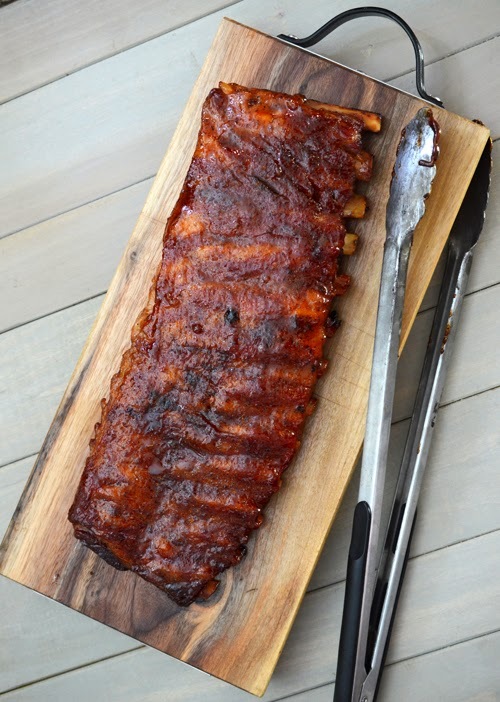 For each rib, place an 18 x 24 double piece of foil on a table and sprinkle lightly with light brown sugar (less than 1/4 cup), a few squirts of liquid margarine, and drizzle about 2 tablespoons of honey. Place the rib down meat side down and then top with the same amounts of sugar, margarine, and honey. Pull the foil edges up to make a 'nest' and pour 1/4 cup of apple juice around the rib and then seal the foil into a packet around the rib. Place them all back on the cooker. I like using a hotel pan so I can get the ribs off of the grill and shut the lid as quick as possible to keep my cooking temps stable. Just leaving the lid open for 5 minutes is enough to let your fire get out of control. Open the foil pack and check for doneness by looking at the bone draw back and flexibility of the rib.. I want the ribs done at noon when chicken turn ins are gone so at this point, I'll either slow down (drop the temp) or speed up (raise the temp) as needed. If they aren't getting done, I'll leave them in the foil. If they are looking done, I'll take them out and put them back on the grill "naked". Ribs back on after being foiled. Warm up the BBQ sauce. Easily the most common sauce used by competitive BBQ teams is Blues Hog Original or Blues Hog Original mixed 1:1 with Blues Hog Tennessee Red. Take the ribs off the grill. Remove the indirect piece (plate setter, spider/pizza stone combo, Indirect Rack/stone) and place a handful of wood chips on the coal. This will give you a burst of smoke. Brush the sauce onto the ribs and a light sprinkle of fine sea salt. 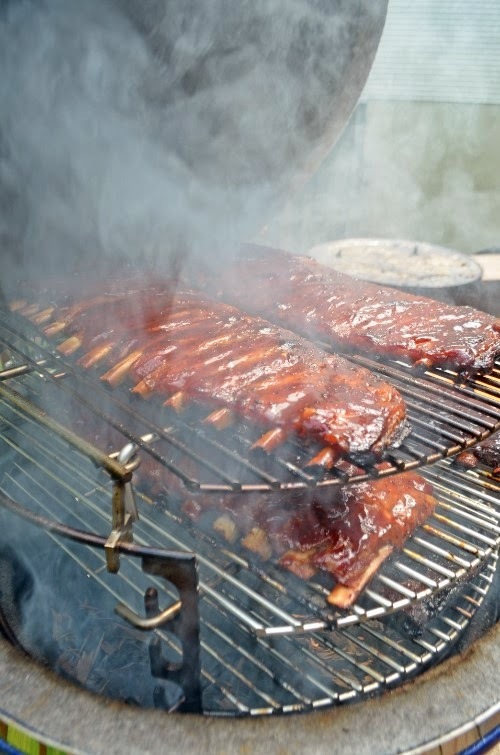 Place the ribs back onto the grill meat side up for 5-10 minutes for one last kiss of smoke. It's going to LOOK like it's getting too much smoke here but for such a short duration, it will be fine. I pick the best looking slabs and then slice them bone side down. I brush the top and sides again with one last thin coat of sauce. I take the best 4 rib sections and plate them in the blind box in a 4 x 4 configuration. At first glance, this box looked okay but that's why I took this mobile phone picture. Judges don't have a lot of time to form their opinion on the appearance of a turn in. In the few seconds they have to see the ribs, the judges' brains reach a lot of quick decisions. One thing that helps create a positive opinion is symmetry and that's what bothers me about this box. The ribs in back are skinner than the ones in front. There are gaps around the third rib on the second row. The front right rib significantly shorter than the others on the front. That's a lot of differences. Do the judges think through all of that in 4-6 seconds that they see an entry? No, but if you give the brain a good dose of symmetry, there's a good chance that judge will form a positive decision on appearance. Wipe the box for any sauce, close the box, and walk/run the ribs to the turn in table. Wish us luck this weekend. I feel like we are ready for it. If you are in the area, stop by our booth and say hello! Update: Got 6th out of 44 well qualified teams at the KCBS contest at Sevierville Blooming BBQ and Bluegrass Festival for these last weekend. Any day you get a call is a good day.